Yoshimizu Shrine (𠮷水神社) is one of the UNESCO World Heritage Site located in Yoshino, Nara Prefecture. In the middle of 14th century, Emperor Godaigo escaped to Yoshino and settled his temporary imperial palace at this shrine. This is one of the oldest Syoin Style House and an only remaining temporary imperial palace in Japan. Yoshino Shrine was once called Yoshimizu Temple. It was used to be the Shugendo temple established by Emperor Tenmu. It became Shinto Shrine after Meiji Restration because it was used to be the imperial palace during 14th century. In 1185, Minamoto no Yoshitsune escaped from his own brother Yoritomo and stayed at this shrine with his wife, Shizuka, and Benkei. 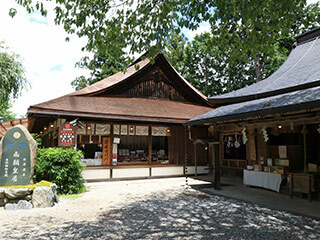 There are many treasures of Yoshitsune and Emperor Godaigo displayed in this shrine. In 1593, Toyotomi Hideyoshi visited Yoshino for the cherry blossom. He stayed at this shrine. This house is the oldest Syoin Style house that is the origin of the Japanese traditional house.